Next to BBQ ribs, I consider lamb chops the finger food of champions. This recipe makes them even better and easy to love with a spicy harissa rub and light salad on the side. The Gourmet BBQ System Sear Grate on the new Summit Charcoal Grill also makes them easy to grill! Searing brings out the flavor in your favorite foods and creates those perfect sear marks. You can learn more about the technique here. The Gourmet BBQ system is one of many versatile features of the Summit Charcoal Grill, our latest innovation in charcoal grilling. For more information on the Summit Charcoal Grill, click here! 1) Remove the circular Gourmet BBQ System™ grate insert, and prepare the grill for direct grilling (see page 11) over high heat (450° to 550°F). 2) In a small skillet, over medium heat, toast coriander, cumin, and caraway seeds until the aroma of the spices are apparent, about 3 to 5 minutes, stirring occasionally. Pulverize the spices in a spice mill or coffee grinder. 3) Mix the rub ingredients in a small bowl. Cut each rack into 4 chops, each about 1½ inches thick and including two rib bones. Lightly brush the lamb chops on both sides with oil and season all over with the rub, pressing slightly to adhere. Allow the chops to stand at room temperature for at least 30 minutes, or refrigerate up to 2 hours before grilling. 4) Whisk the oil and lemon juice together in a medium bowl. Add the garbanzo beans, tomato halves, and cilantro. Season with the salt and pepper and mix well. Let stand for 15 to 30 minutes before serving. 5) Place the sear grate in the cooking grate, close the lid, and heat for 5 minutes. Place the lamb chops around the outer perimeter of the grate, with the bones facing out, spoke-style. 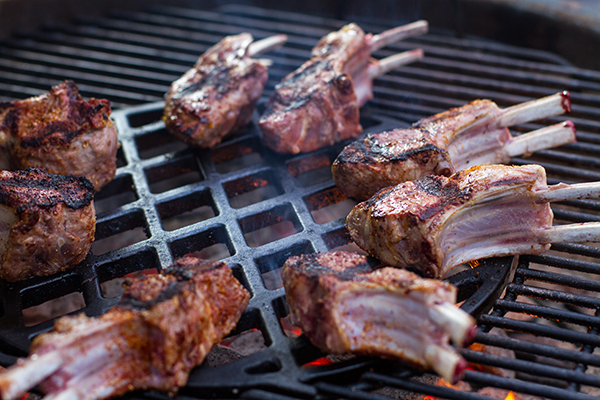 Grill the chops over direct high heat, with the lid closed, until cooked to your desired doneness, about 8 minutes for medium-rare, turning once or twice and maintaining the temperature between 450° and 475°F. If flare-ups occur, move the chops to indirect high heat. Remove from the grill and let rest for 3 to 5 minutes. Serve the chops warm with the salad and lemon wedges.